As a coach Steve Kean may well have had aspirations to manage at the highest level, perhaps he had ideas of his own that one day he’d weave in to his own team unit, or as has happened, he’d be thrust in to the managerial hot seat, not really understanding what his philosophy was and revert to the team’s default settings as applied by his former boss. On the day it became too much for Blackpool to withstand for a full match as a 2-0 lead resolved itself to a 2-2 draw. Both sides will be happy with the outcome, especially given the peculiar performances of the referee and one of his assistants. However, as much as Blackburn are repeating their play under Allardyce, Blackpool are failing to covert an advantage in to three points and (according to Opta) have now conceded 20 goals in the last 15 minutes of games this season. The movement of Junior Hoilett gave Blackburn added dimension upfront. During the week Ian Holloway talked about changing his approach, however, going in to this game, he set his team up in the same way as usual, however, there was a more cautious approach off the ball as his 4-2-3-1 shaped in to more of a 4-5-1 getting 10 men behind the ball when defending. 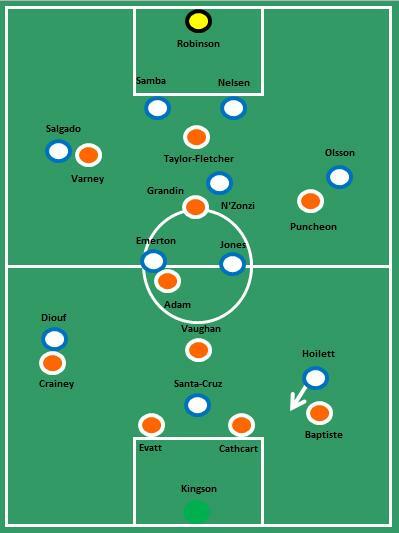 Steve Kean had his side mapped out in an approximate 4-3-3. However, out of possession they reverted to a 4-1-4-1 with Steven N’Zonzi holding a deeper position than Brett Emerton and Jermaine Jones, and the wide forwards tucking in deeper than their more advanced position when their side had the ball. Both game plans were uncomplicated and easy to spot. Kean’s game plan appeared to be two fold, firstly, get the ball to Junior Hoillet’s feet allowing him to run at the Blackpool defence. Secondly, to deliver high ball from back to front to gain territorial advantage, aiming to win the ball high up the pitch either on the first, or subsequent attempts. Holloway set his team up to be more solid out of possession to ensure that they were defensively more robust and looked to counter Blackburn quickly through short sharp passing and fast off the ball running. Paul Robinson’s distribution is the main observation from the game. 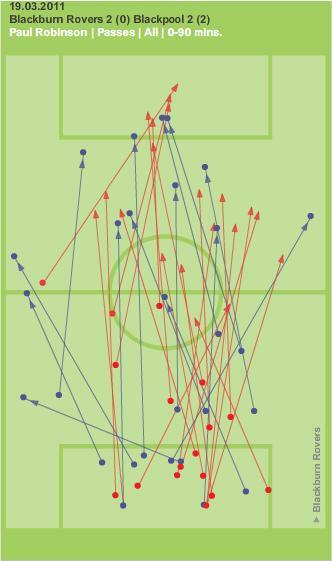 The chalkboard below shows his passes for the game. It’s plainly clear that he (as under Allardyce) is still under instruction to hit the ball long at every attempt. It’s fair to say that he is well drilled and control’s his distance well, rarely did he go to long and after plenty of practice he started to put it just beyond the Blackpool defence, who couldn’t help but drop deeper to try and deal with the ball. Direct passing of Paul Robinson from back to front. 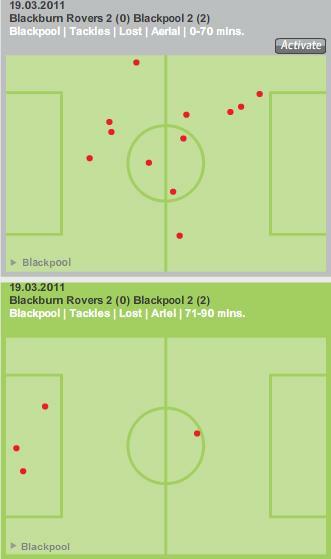 As Blackburn went direct with their aerial bombardment Blackpool had to deal with and try to win their aerial duels. They ended up losing 16 of their 30 aerial duels, however, the key here is that for the first 70 minutes they didn’t lose one in that key area, the penalty box. However, as they either tired, lost concentration, lost organisation or a combination of all three they served to lose 3 duels in the box as Blackburn’s bombardment took its took toll. The top half of this image shows that while Blackpool lost aerial duels, none occurred in the box. In the last 20 mins as shown in the lower half, they did, 3 times. Tired? As Blackpool conceded another late goal, the recriminations centred on Kingson and his defence. However, Blackburn knew what they were doing and the ball from Robinson at the death was in the perfect area to cause doubt for Blackpool’s defensive unit. As an illustration of the problem Blackburn caused Blackpool then look at the image below from earlier in the bombardment. The ball isn’t as deep (as the next example), the defensive line doesn’t drop and Kingson can stay back in case Blackburn win the duel. The line holds firm, Adam clears. Then take a look at the image from the lead up to the final goal below. The ball is deeper, the defence then drops. Here the communication between the defensive unit is called in to question. It appears that Kingson feels it’s his ball to collect, perhaps he shouts, if so the defence must stop and let him collect; dropping too deep crowds his space. He should win the duel and should there be any contact then the benefit of the doubt would go for Kingson. If Kingson hasn’t called then he has made an error in coming for the ball and should trust his players to do what they had been doing all game. It’s interesting to note with these two examples, is that the person who made the first clearance (Charlie Adam) wasn’t on the pitch when the second example took place. As noted earlier, both teams will be happy with a point from the fixture. Blackburn should be safe in the Premier League, they know what they’re good at, but teams will sting them regularly on the break and they’ll get some beatings before the season is over. Blackpool on the other hand had some great moments on the break, but the main concern remains focused on their defensive unit. If they can keep a clean sheet or two between now and the end of the season then they may well be a part of the elite division next season.